Last night I woke with a start three times from some very lucid and very scary dreams. I won't go into details but these were 18 certificate horror movie worthy dreams. I completely blame these effects on the myriad of stunning beers I drank this weekend at the European Beer Bloggers Conference (EBBC) in Leeds. They must have twisted my mind with too many wacky flavours and fantastical ideas. 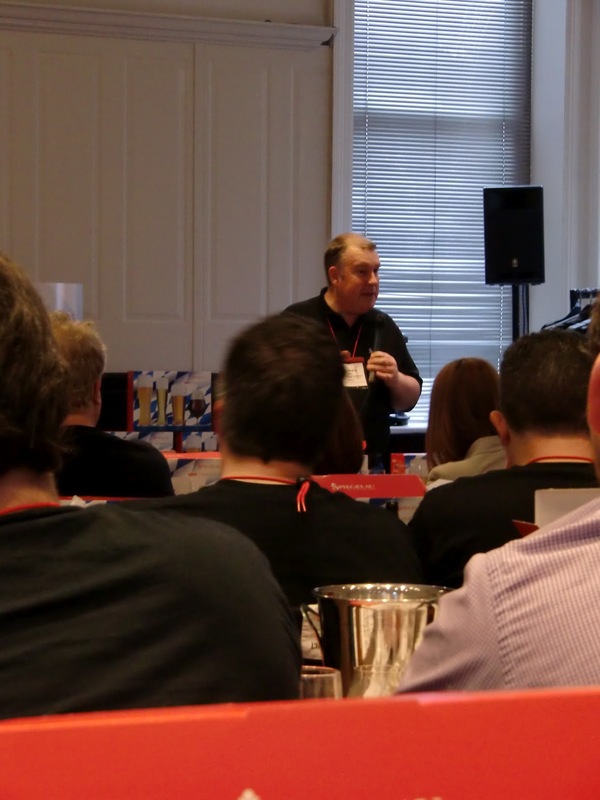 Before the conference I decided I would write about my top five beers of the weekend and the beers offered to us by the conference sponsors gave me plenty to decide from. As I mentioned in this post about innovation I think that there is a trend in some British restaurants to use modernist molecular cooking techniques to try to imply a forward thinking kitchen and chef. Whereas I believe that true innovators create their own ideas, techniques and dishes. I think there is a similar problem in some breweries. This was touched on at the weekend by Adrian Tierney Jones (I think) in his talk. When asking an unnamed brewer why they brewed a certain new beer the brewer replied "because we didn't have anything in the 4.5% slot". I think there may be another problem and that is a trend in newer breweries to follow fashions. Waves of trends of beers come through the breweries that are almost identikit versions of craft US beers. 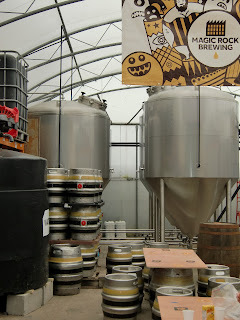 A lot of new breweries seem to have a US style IPA, a black IPA, an imperial stout etc. This isn't innovation, this is copying beers and relying on the newest hops to be developed in New Zealand or the US to deliver new flavours. 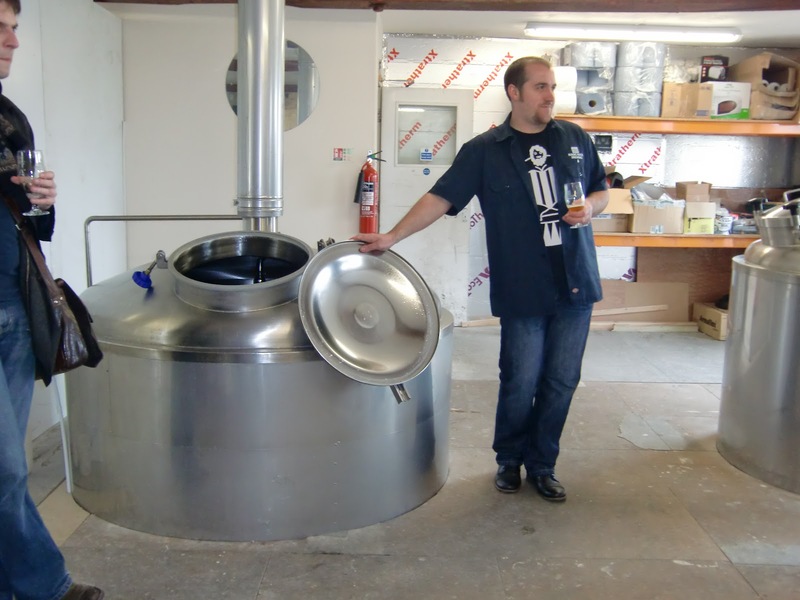 I think this is fine for home-brewers but I want my commercial breweries to show some original thinking! 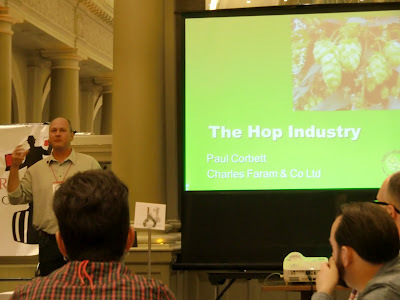 Well, in this blog's spirit of innovation I have picked my five six conference beers as the most inventive and interesting from the weekend. This is an 11% version of the Williams Bros heather ale which is then aged in sherry casks previously used to age Auchentoshan. This was the first beer of the weekend for me and I was blown away. It's a rich, sweet sipping beer with the fragrant woody heather flavour giving it a pudding quality. At EBBC it was very good to see this and many other speciality beers in 75cl bottles. I like having enough beer to share between three or four people when I spend a lot of money on it. A stingey 330ml doesn't do it for me. 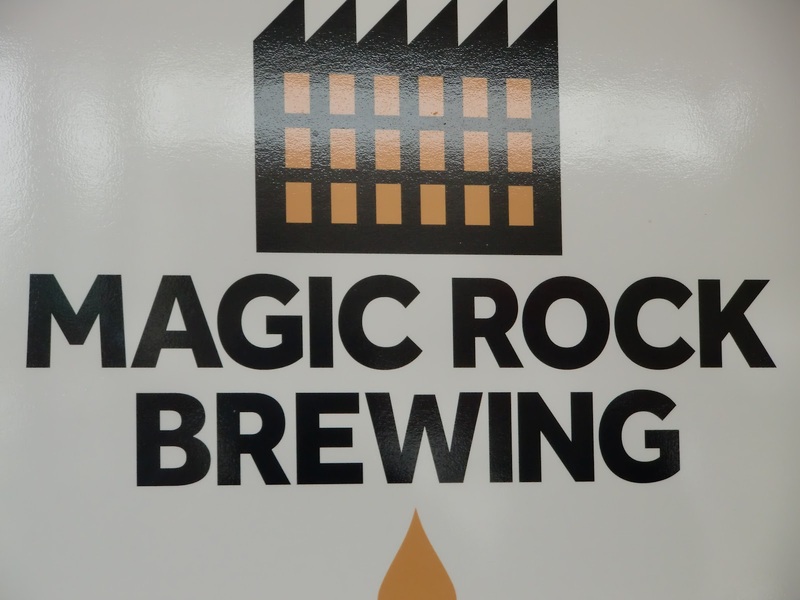 On the Sunday of the conference the majority of the attendees visited Magic Rock Brewery in Huddersfield. 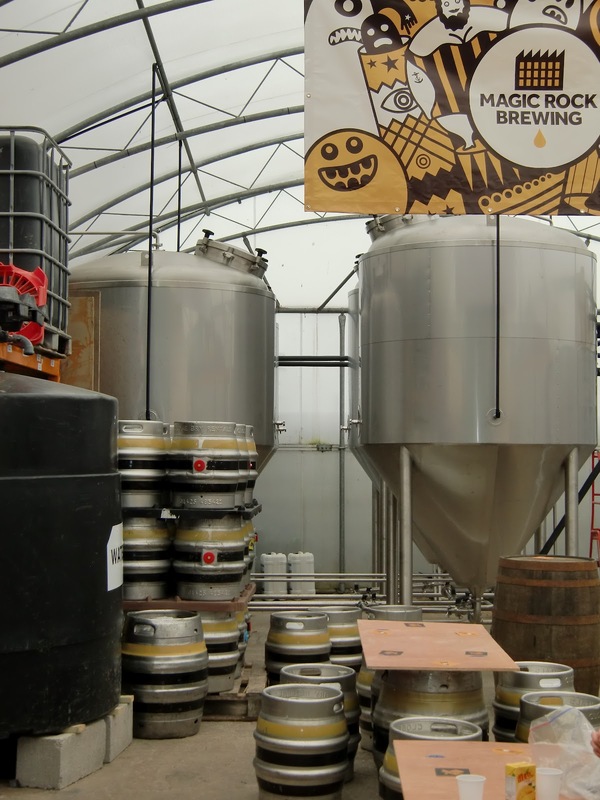 Part way through our tour of the brewery the volume of the murmur of the crowd outside rose, mutterings of bearded lady could be heard and something about bourbon. 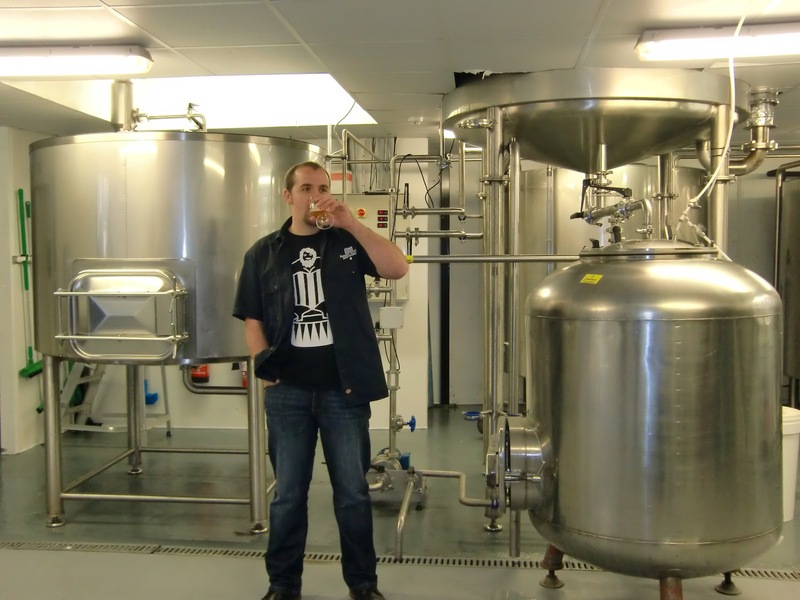 The tour finished and the first glasses of this 10.5% Imperial stout were being poured. It has been aged in a bourbon barrel for 3 months before kegging and bottling. This silky smooth and slightly sweet stout, enriched with bourbon and wood smokiness made everyone grin and even enticed the sun out. This wine/beer hybrid was slightly dismissed as being not really beer by many I spoke to at the night of many European beers. 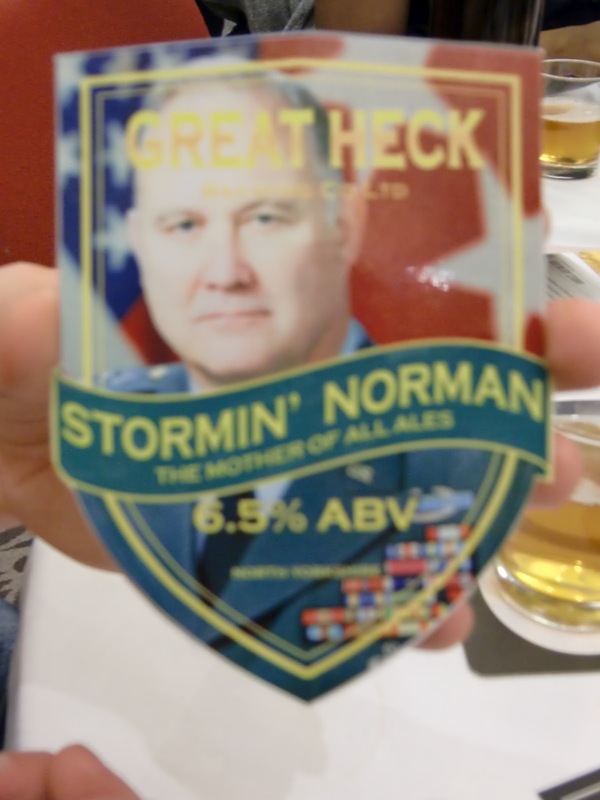 But I thought it was a wonderful example of forward thinking in beers. It sparkled on my fatigued taste buds, at once lambic, champagne, cider? 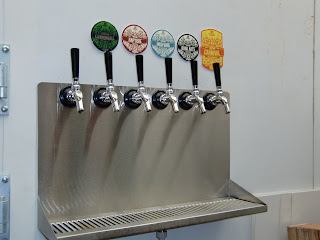 If bloggers want restaurant goers to start appreciating beer then this is one of the ways to go about it. Elegant and refined it would be a perfect way to start a meal, ideally sat in the Italian evening sun. I've only had a tea beer once before but I have been obsessing about it ever since. 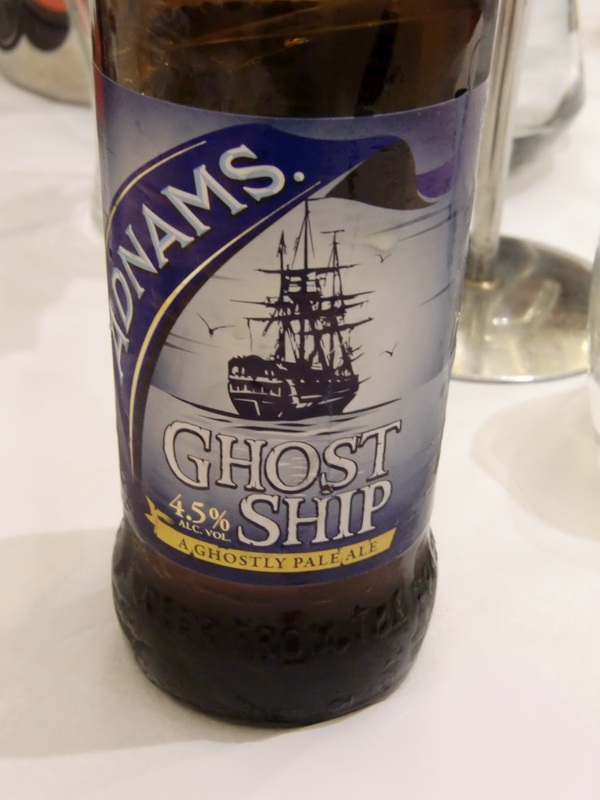 I think that the potential with tea flavoured beers is huge. The variety of tea flavours, while not quite rivalling hop varieties, is wide and the flavours that come from tea bitterness, tannins and aromatics, complement those of beer very nicely. Well I'm obviously not the only one. At the speed dating version of beer blogging, bloggers favourites Marble served up their Earl Grey IPA. How very British! The idea was that the bergamot from the tea would add unusual flavour whilst adding a complementary bitterness. I could have done with even more tea flavour in this very drinkable IPA but I applaud Marble's experimentation and spirit of collaboration - this beer was brewed with Emelisse brewery in the Netherlands. 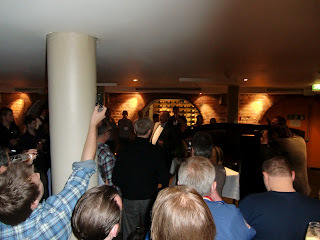 There was a pub crawl Thursday night before the conference that we unfortunately couldn't make. It started at Mr Foley's, a bar stocked with some fantastic beers. Needless to say I was quite gutted to have missed out. Sensing my disappointment Claire and Soph suggested we went for a half in Mr Foley's before our train home on Sunday. It turned out to be a fantastic suggestion as we all had a half of Nogne O's Two Captains, a very surprising double IPA which smelt of stone fruit and fruit pastilles. It tasted of rich sweet peach cobbler and custard. I could have drunk this all day, a dangerous thought considering the 8.5% ABV, the £4 per half pint price tag and our impending train departure. We left Mr Foley's for the train station but not before being sold five bottles for the train by loveably dry barman, Tyler, who taunted my inner beer geek with his talk of limited imports and special editions. 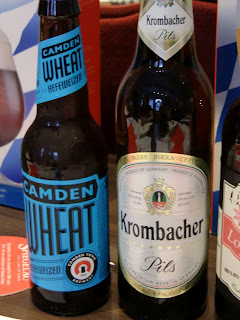 One of these bottles was Flying Dog's Wildeman Farmhouse IPA. Apparently one of Flying Dog's year round beers, though this is the first time I've seen it in the UK. Soph and I both bought a bottle with the intention of perhaps doing a simultaneous Twitter tasting on our trains home. 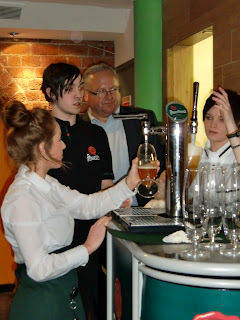 Well, all I can say is that Claire and I tasted our bottle and it blew my frazzled mind. It's a heavily hopped saison, with lemony citrus farms on the nose and fruity, earthy, funky hits on on the tongue. Refreshing and satisfying at the same time. 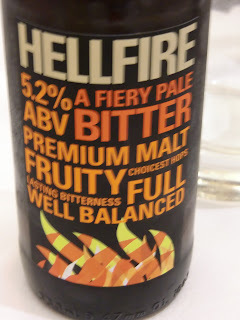 A very successful hybrid of two different styles and as such a late entry into my top five six beers of the conference. 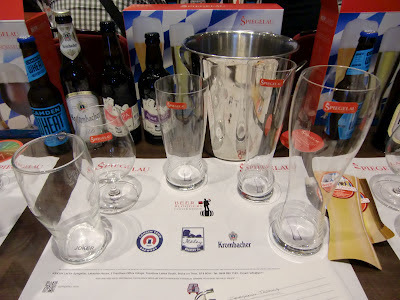 I hope this post gives a good idea of the fun and education we had at the conference and there were many more interesting beers than just these six. 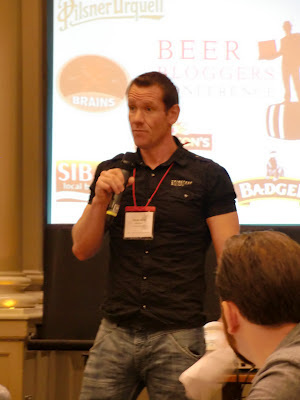 I would like to thank Allan and Elle from Zephyr Adventures for organising the conference and to Molson Coors for sponsoring the event and our registration. 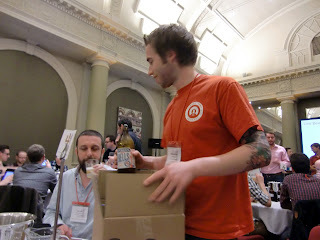 Sam & I spent last weekend in Leeds at the European Beer Bloggers Conference 2012, sponsored generously by Molson Coors. These are just some brief notes and photos from the event - Sam will be following up with his top 5 beers of the conference soon. 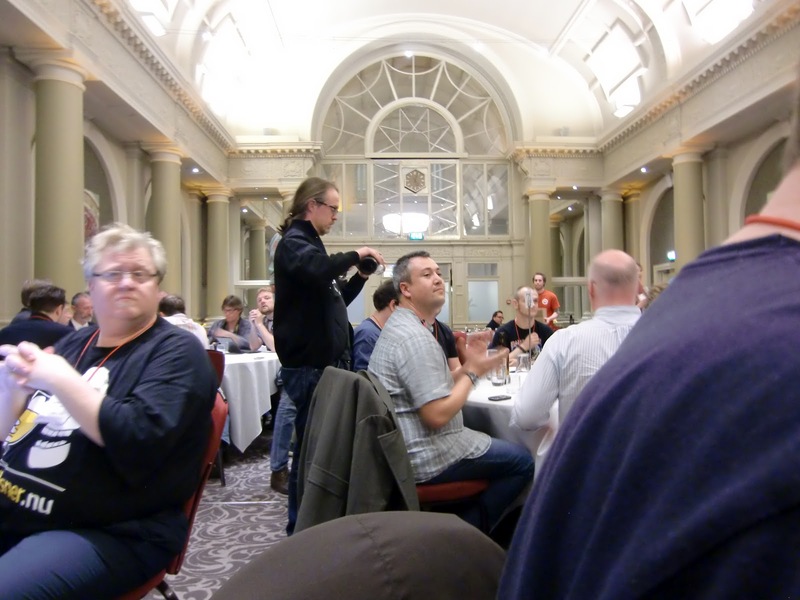 The conference venue at the Met Hotel Leeds - the event started with a trade show and beer tasting featuring Molson Coors, Brains, Williams Bros Brewery, St Stephanus, Shepherd Neame, SIBA, Badger, Spiegelau, and Marstons (apologies if I've missed anyone off this list). 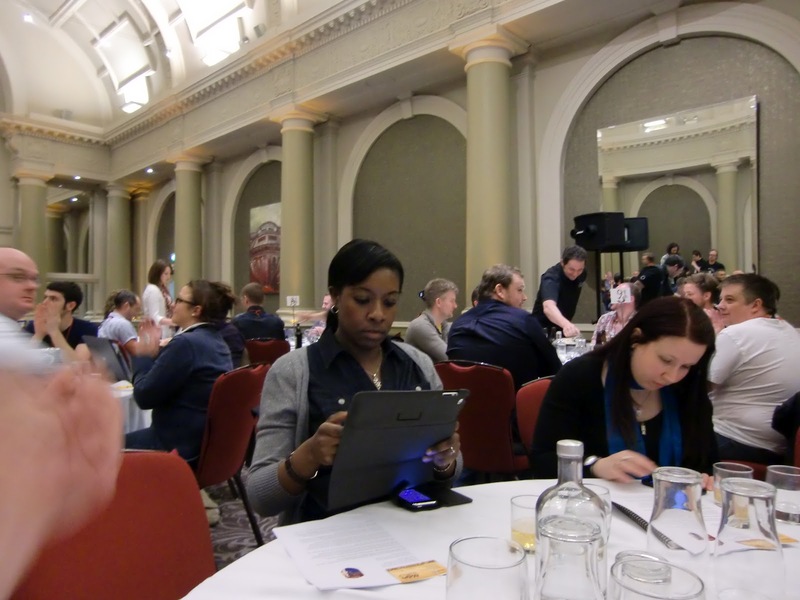 Afternoon sessions covered beer blogging in Europe, improving your beer writing, and a technical session on blog platforms and website design (my personal favourite). 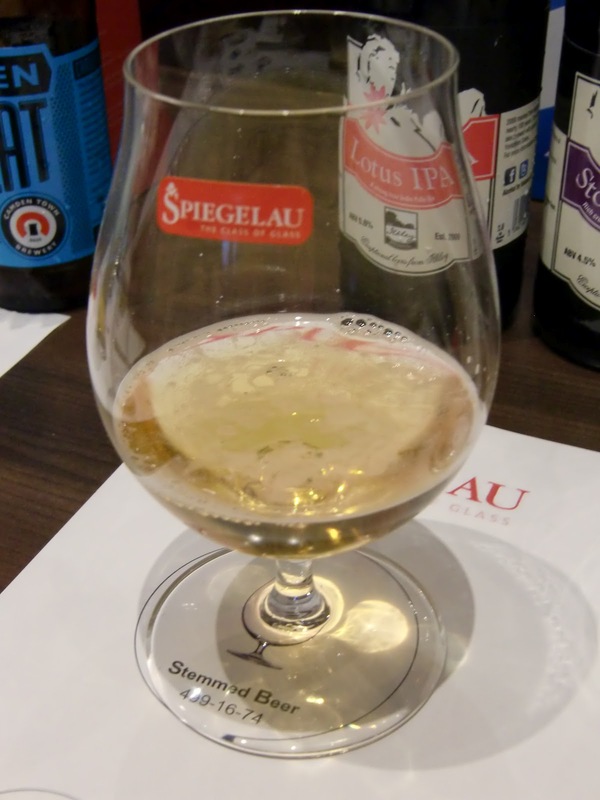 We then went on to a comparative beer & glass tasting with Spiegelau - I was dubious about this one (and equally skeptical about similar claims made regarding wine glass shape and the effect on taste), but I'm willing to admit that the examples we had did demonstrate some subtle differences in taste dependent on the glasses being drunk from. 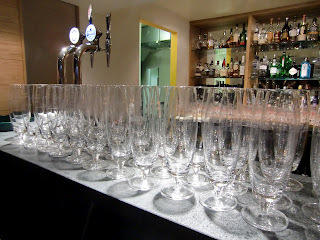 They are also rather fetching glasses! We then moved onto dinner (I forgot to take photos other than the above). 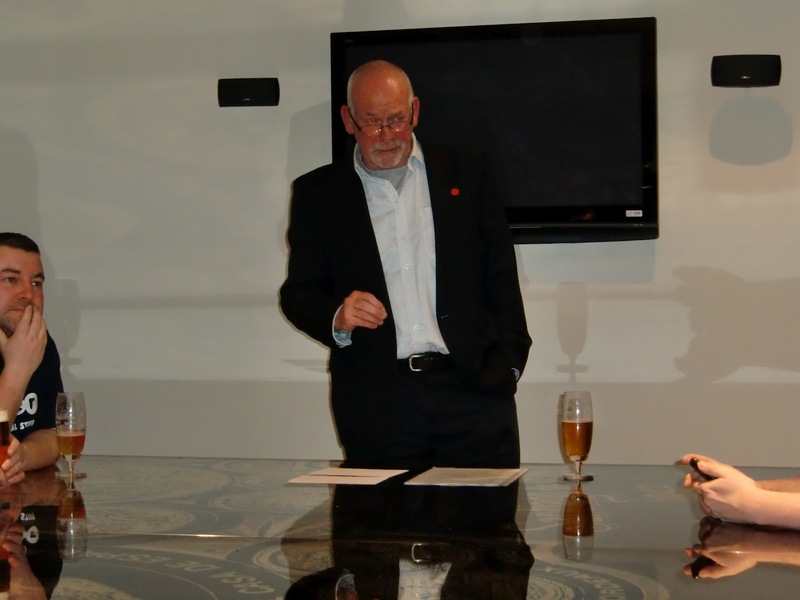 The menu was matched by Stuart Howe with the new Sharp's range, Connoisseurs Choice - all designed to be paired with food. 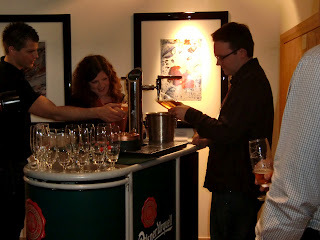 First up was an aperitif of Sharp's Single Brew 2011(4.5% ABV). To start we had a salad of poached pear, watercress and minted melon paired with Sharp's Honey Spice IPA. The main course was hake served with a light horseradish and pea cream sauce paired with Sharp's Honey Spice Tripel (10% ABV), and dessert was banana and rum toffee tart served with Sharp's Quadrupel (10% ABV). A digestif of Sharp's Turbo Yeast IV ended the meal (a bit like marmite - you either loved it or hated it), and led us into the night of international beers where we tasted some great examples of what Europe has to offer (sadly it seems not many of them are available/imported into the UK). My beer of the night was L'Equilibrista from Birra del Borgo - a champagne sour ale, made with 39% Sangiovese wine wort fermented with wine yeast and then re-fermented with champagne yeast. It reminded me of a good quality gueuze similar to those we tasted at Cantillon last year. The following day we had talks on taking blogging to the next level, social media and your blog, and the current state of the hop industry, before the keynote speech from Stuart Howe, head brewer at Sharp's. Slater's controversial Top Totty (4.0% ABV) - a bunnygirl-free pump clip is also available! 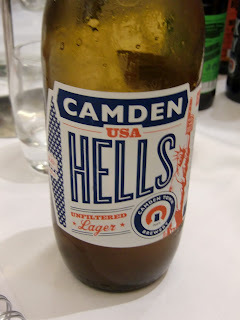 Camden Town's USA Hells (unfiltered, a limited release brew) - wow, this was really good. 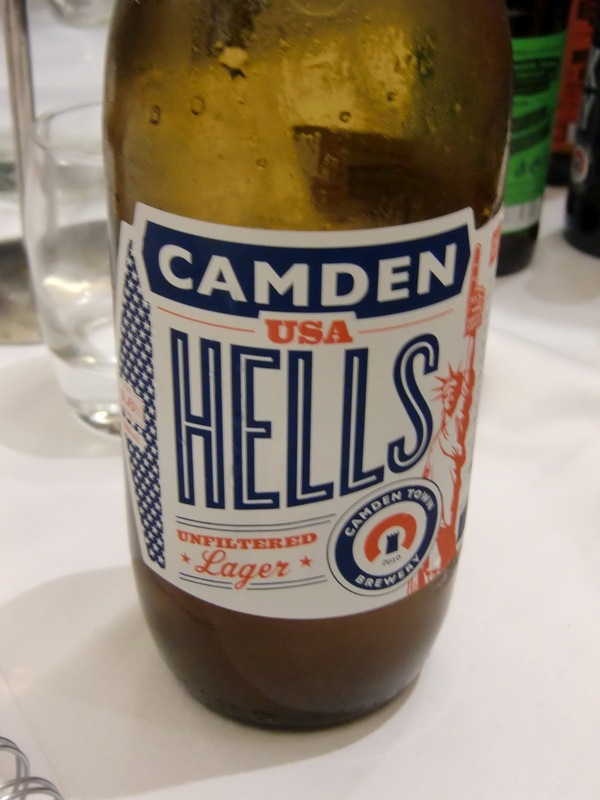 I didn't really rate the Hells Lager when I tasted the regular version, but this was delicious and a revelation, with a deep flavour and fuller body. Apparently they are due to release a sour beer soon (summer 2012) - I can't wait to try it. 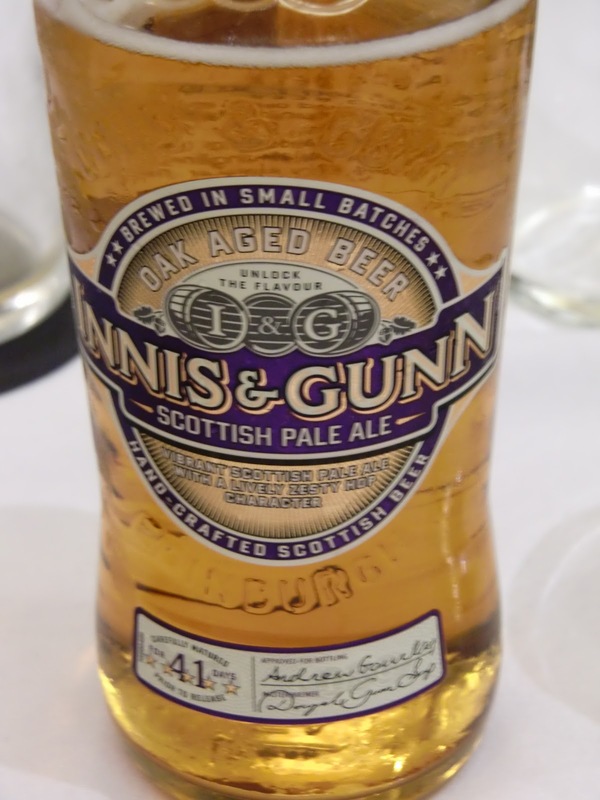 Innis & Gunn's Oak Aged Scottish Pale Ale (7% ABV) - aged in bourbon barrels for 41 days to add flavour and residual alcohol. My first ever taste of an Innis & Gunn beer, not too bad, but too sweet for my taste, the flavour coming across as muddled. Leeds Brewery's Hellfire (5.2% ABV) - designed to appeal to a wider market, to be swigged from the bottle and to appeal to a younger demographic. This had a crisp citrus flavour, with bitterness and hops which follow on and build - a bit too hoppy for me. Otley's Oxymoron (5.5% ABV) - a Welsh black cask IPA. Citrus, chocolate and coffee, hops and roasted malts, this was refreshing and much lighter than I'd imagined it would be. 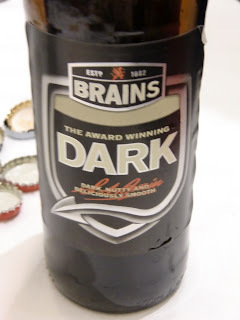 Brains' Dark (4.1%) - apparently this has to be drunk with a Clarks pie, and is thier longest running beer (since 1882). This is 3.5% on cask and I can imagine it would be a great session beer. Lighter than imagined, but full on flavour, with chocolate, liquorice and treacle notes. It was also a pleasure to meet the lovely Ffion. From Marble; a collaboration Earl Grey IPA (with Emelisse) (6.8%) - the nose was strong on hops, but it wasn't as strong on taste (a relief for me), made with Earl Grey tea. 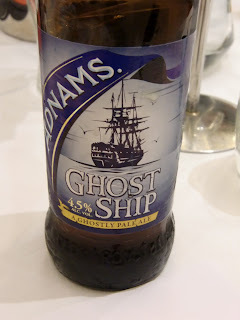 From Roosters we tasted Baby-Faced Assassin (6.1%) - a cask ale (sorry no photo) with a thick creamy head, it was hoppy but mellow and very easy-drinking, with a creamy mouth feel. They also mentioned a collaboration with Odell's which will be available from July 2012. And finally, Great Heck's Stormin' Norman (6.5%) - hoppy, caramel and citrus notes and malty, catering to the pub crowd, with low carbonation and a moderate bitterness. I'm afraid my notes are vague as beer fatigue had set in by this point! 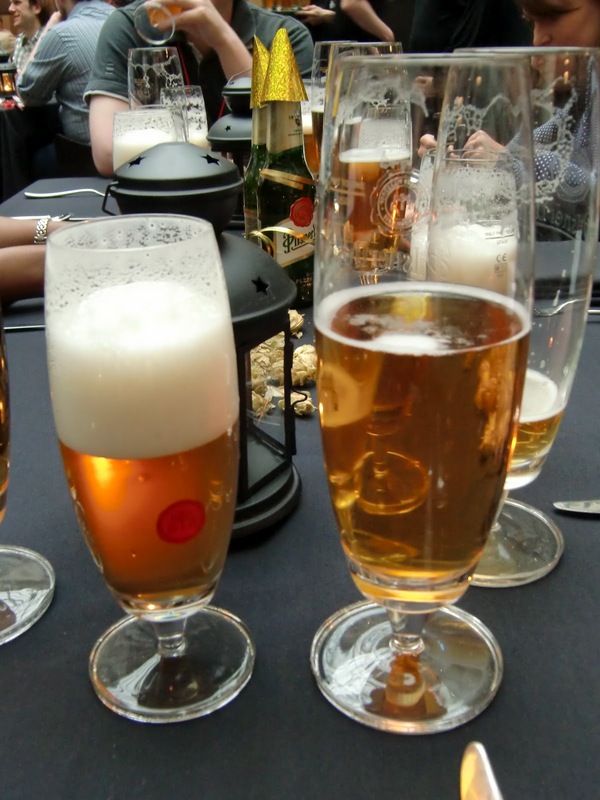 After a quick breather we moved onto a Czech feast - dinner at Anthony's at the Corn Exchange, sponsored by Pilsner Urquell. We were greeted by some freshly poured Pilsner, and Anthonys' staff wandered around with slates laden with tasty treats. The barrel of unfiltered Pilsner Urquell is cracked open. Settled down for dinner with Sophie, Marv, the girls from Brains, Steve (not pictured) and the lovely Allan from Zephyr. After the meal we were split into two teams and herded off to the after party/pub crawl. I wish I had one of these in my garden. All in all a fantastic but exhausting three days. 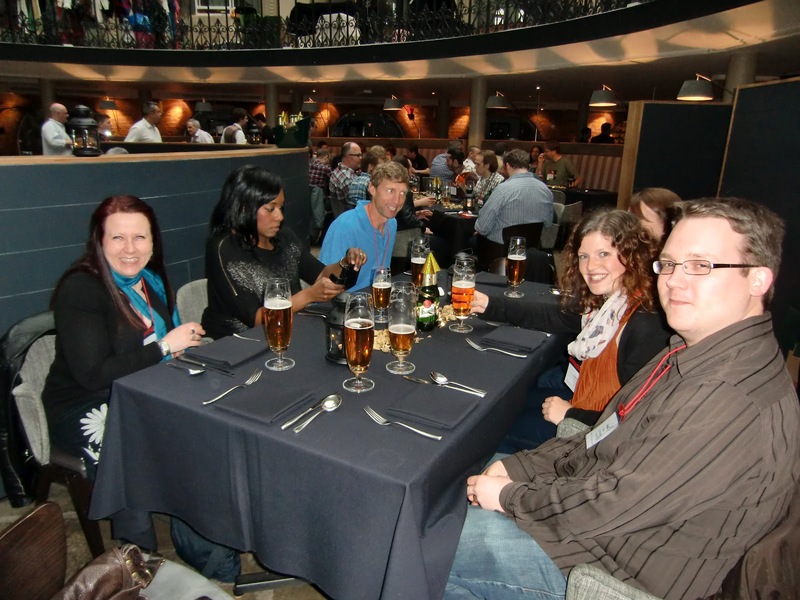 Huge thanks to Elle and Allan for organising such a good weekend. I have a habit of lusting after new and old cookbooks and as a result the collection is getting quite large. I don't know the exact numbers but it fills quite a few shelves and I can't see an end to its growth. (I have though, made up a category system that they fall into*) It doesn't help that certain members of my family are feeding this addiction. Indeed when my parents-in-law visit any foreign country on holiday they will always bring me back an English language version of a local cookbook full of the country's specialities. Some of these books have some temptingly wacky recipes. Curried eggs on chipsticks and cow's udder are sitting deep in the archives biding their time. In the spirit of food exploration our blog is now following, I have decided to release some of these mutant recipes from their cookbook prisons in a new series of posts. 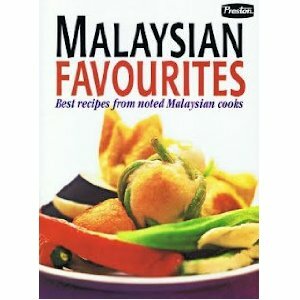 One of these recipes is in the very bright, Malaysian Favourites which contains dishes by some of Malaysia's most noted cooks. It's full of spicy curries and strangely colourful gelatinous desserts but it was one recipe in particular that always caught my attention. Now there isn't anything that unusual about Murtabak, a range of variations of this stuffed pastry dish are cooked all over Asia but it is the main ingredient of this Malaysian version that makes it stand apart. Instead of the usual pancake or flatbreads, this one is made with layers of cream crackers with curried beef, coconut milk and evaporated milk. Intrigued to see how this flavour combination would work, I got cooking. 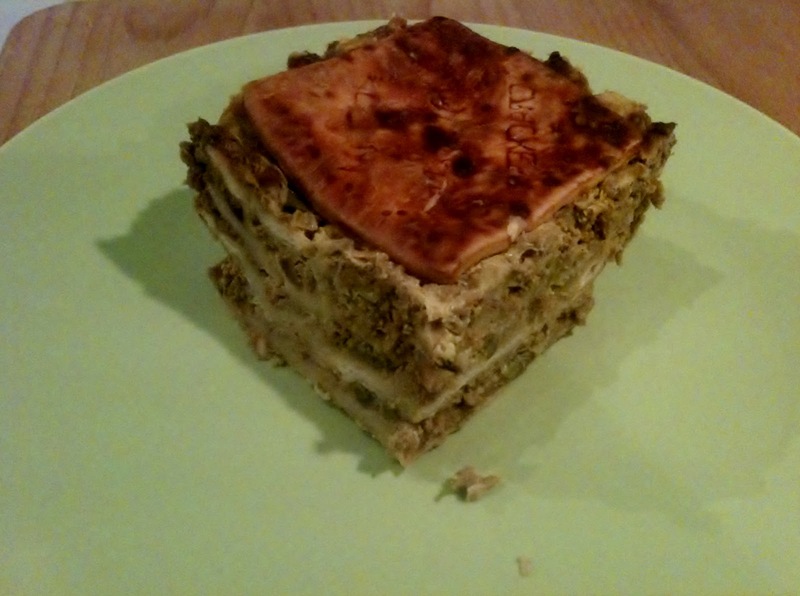 1/9th of the finished murtabak looking pretty much like the photo in the book. Appetizing isn't it. This version of murtabak is supposed to be eaten cold and as it turned out was a pretty good lunch box filler. 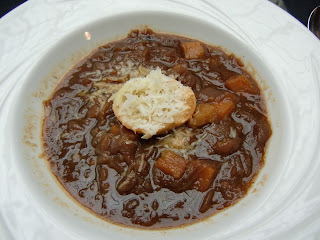 It is a bit like a curried coconut meat cake which, over the week it took to get through, really grew on me. I have reproduced (quickly and loosely) the general recipe from Malaysian Favourites below with my own adjustments and some advice. You'll need a square tin or dish that will fit 6 or 9 cream crackers neatly in the base. Fry a paste of garlic, shallots and ginger with enough curry powder for a minute or two then add 500g of minced beef. Fry for a few more minutes and add a mug of water. Cook until the water is evaporated (I add a couple of tablespoons of mango chutney at this point), add a couple of chopped onions, cook until soft, then leave to cool. Mix together a can of evaporated milk and a can of coconut milk and bring it to the boil. Season and set aside. Now build your murtabak: for the first layer dip crackers in the milk mixture and line them up neatly in the base of your dish. 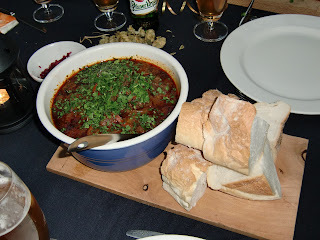 Then add layers of the beef mixture, chopped spring onions, chopped chillies beaten egg and back to soaked cream crackers. Repeat until you get to the top of your dish or run out of beef. Including the top and bottom layer you should have 5 layers of cream crackers. Pour over the rest of the milk and dot with butter. Bake this beauty at 200C for 50 minutes and leave to cool. It should firm up nicely for you to slice, take to work and make all your colleagues jealous/disgusted. In all seriousness this was pretty good. The chillies and spring onion do balance the coconut milk and evaporated milk to some degree. Books I actually cook from. Vinegar is often not considered as anything more than part of a vinaigrette and malt vinegar is the poorest member of the vinegar family normally seen sitting on the chippy counters and shaken on soggy chips. The bottle of Sarson's I grew up with was never replaced and it didn't need to be. Self preserving and of limited use, it was only brought out on the rare occasion that Dad brought home cod and chips on a Friday night. I'm interested to explore the uses of malt vinegar and to do this I have to go beyond that old bottle of Sarson's. 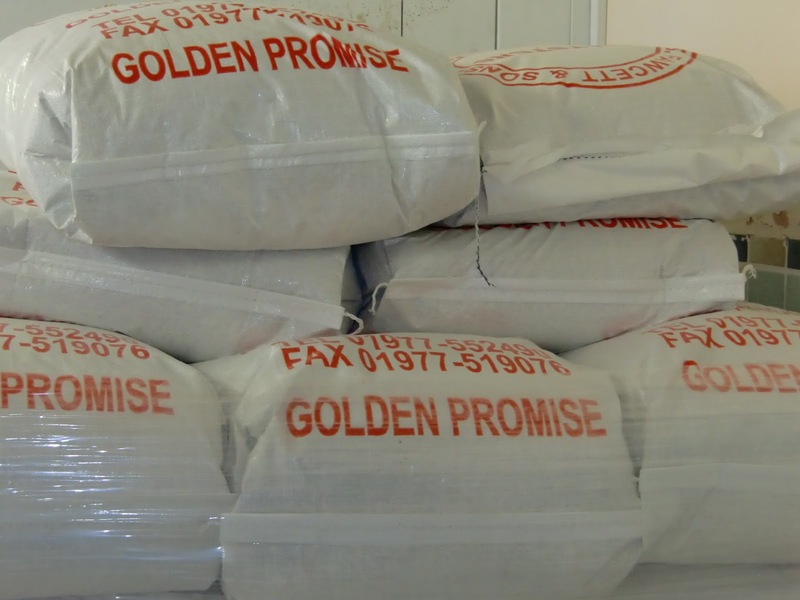 Malt vinegar, also known as alegar, is made by fermenting beer into acetic acid. 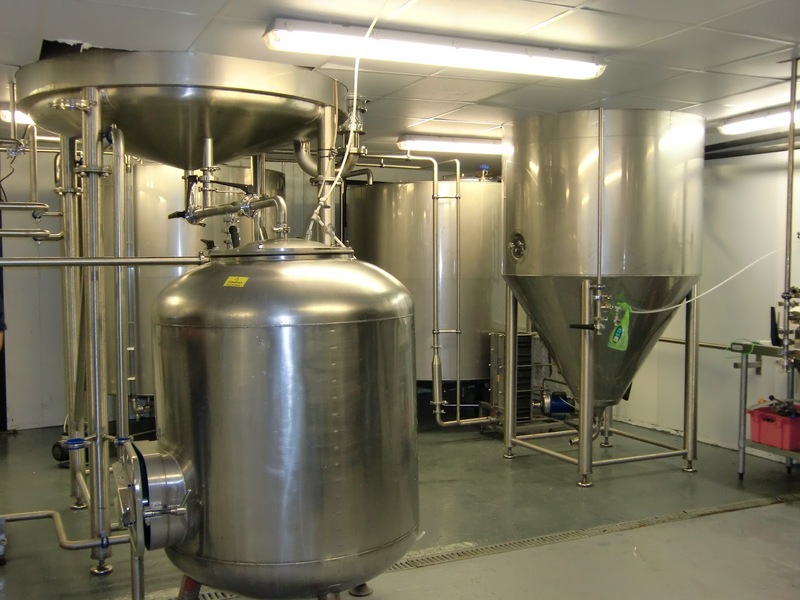 Most commercial malt vinegar is made from a simple beer and matured to mellow out the harsh qualities. In theory any alcoholic beverage, and therefore any beer, could be used to make vinegar. In my new spirit of innovation and discovery I thought I would see if different beers showed their malt and hop characteristics when vinegarised. Any time I try a new food project I consult the Ideas in Food book by Aki Kamozawa and Alex Talbot. 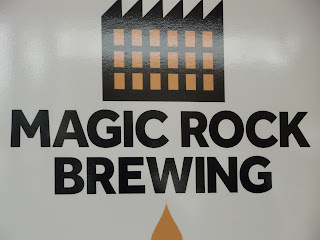 I was interested to read that they made some Guinness vinegar so I based my experiment on their recipe. I picked two beers that I thought would create interesting and contrasting flavours, Sierra Nevada Pale Ale and Fullers London Porter. As well as a source of alcohol, to make vinegar you need something to feed on it. For this I used a bottle of unpasteurised Aspall malt vinegar which should contain a healthy culture of acetobacter. Aki and Alex use either a wine or cider vinegar but I didn't want to impart any extra flavours so the character of the beer could come through. I split the bottle between two sterilised jars and then topped each up with one of the beers. 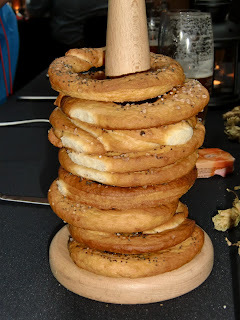 I tasted the beer vinegar mixes at this point and and I really liked them (I think I've been drinking too much lambic), then as per the instructions in Ideas in Food, I tied some cheese cloth round the tops and popped them in the airing cupboard. Two weeks later the beer smell had mostly gone and was replaced with the pungent smell of vinegar. Easiest recipe ever! When tasting the vinegars for the first time I was glad to see that there is a big difference between the two. 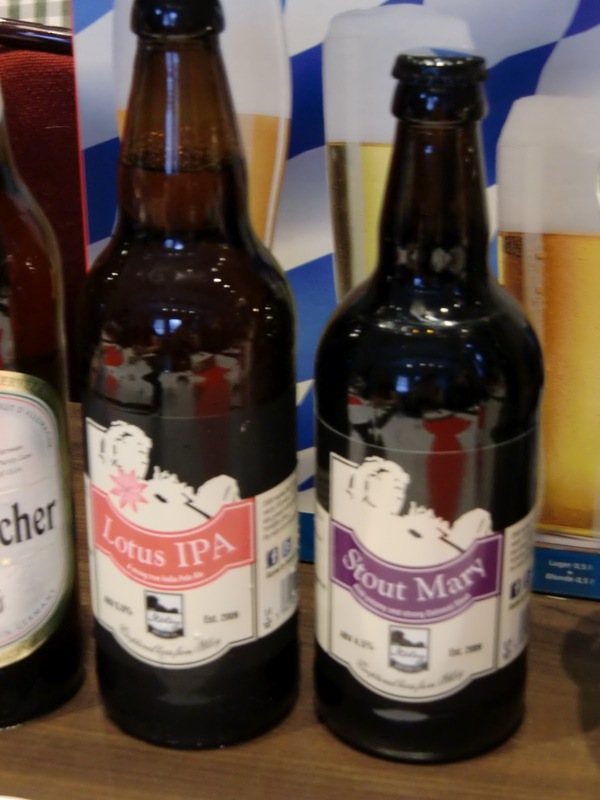 While both vinegars have a more complex flavour than the mother vinegar, the porter vinegar has retained more of the beer flavours than the pale ale. The porter has kept its nutty, burnt wood qualities and has a deep almost aged after-taste. I can certainly imagine making some pickles with this and perhaps adding it to stews and pasta sauces to balance dishes. If I make more I would certainly like to age some to see how the flavour develops over time. 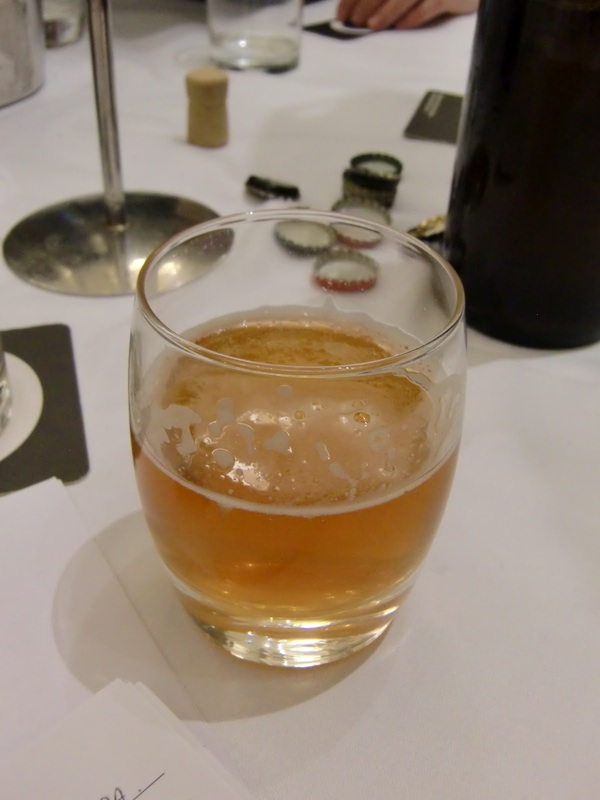 The pale ale vinegar has far less pronounced characteristics of its original beer. I was hoping for some big hop flavours but these seemed to have dissipated leaving behind an interesting but clean and sharp vinegar. I have only used it in vinaigrettes but these have been delicious. This process is so easy I'm surprised more people aren't doing it. 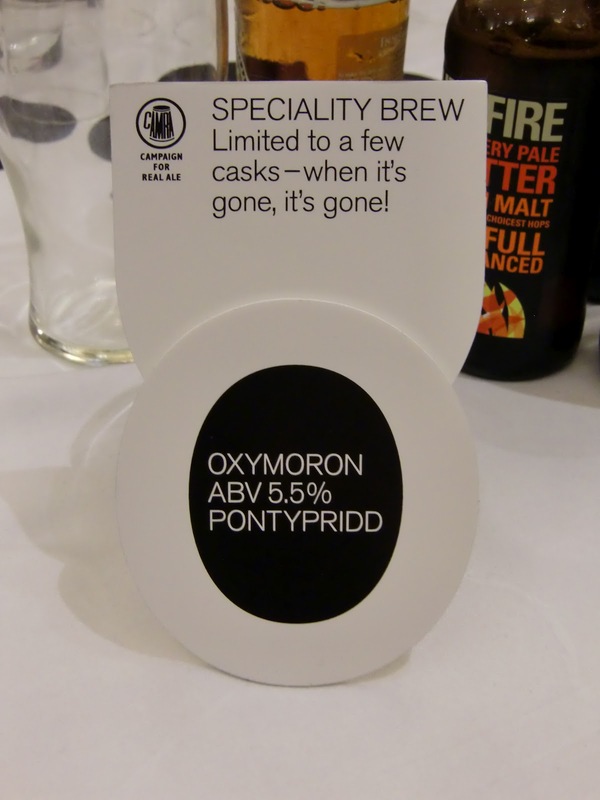 It is definitely something to consider for batches of slightly ropey homebrew! So try it out. 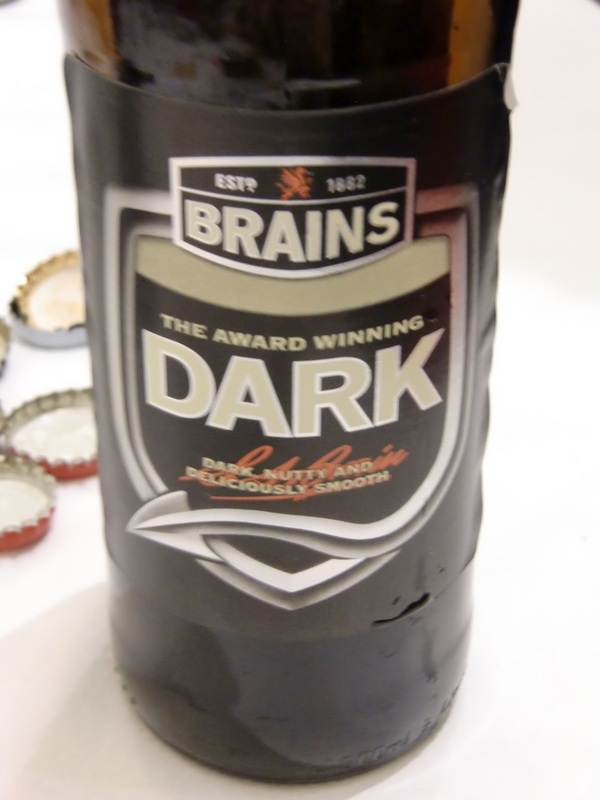 All you need is a bottle of beer over 5% abv, a bottle of unpasteurised vinegar and a jam jar. On another note, soured beers, like lambics and Flanders red ale, can be used instead of vinegar in cooking. I love the idea of a kriek dressing for a duck salad or a Russian River Supplication in place of sherry vinegar in Spanish style dishes. 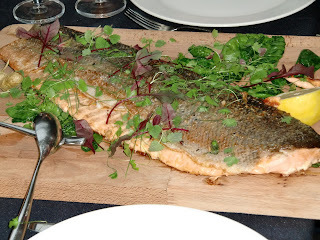 This is just a quick post about a meal we had a couple of weekends ago - the Sunday Supper Club at Odette's in Primrose Hill. Originally I hadn't planned to write this up, so I didn't take my camera (and I have a slight aversion to taking photos of my meal when out) - I apologise for the quality of the photos I have here, as they were taken on a 'phone and are pretty awful. Sam had seen the evening advertised in an e-newsletter, and had booked it on a whim to surprise me. The Supper Club takes place 4 times a year and each one has a theme - a seasonal ingredient which is the star of the show. Previous evenings have focussed on truffles, peas, chocolate and rhubarb - this time it was carrots. One of the nicest aspects of the evening was that chef Bryn Williams came out before each course to explain what we were going to be tasting, and to answer any questions we might have. 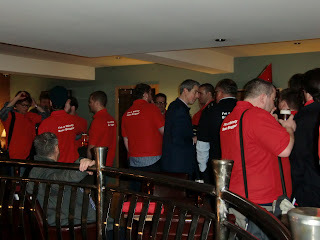 Bryn was very friendly, quite informal and it was a lovely touch. We finished the meal with coffee and petit fours and had a brief chat with some of the other diners, some of whom had been to every Supper Club to date. It was a lovely evening; reasonably priced, delicious food, some lovely wine pairings and we look forward to returning to Odette's soon.